Fender's Reissued '68 Custom Princeton Reverb: A Classic Reborn! 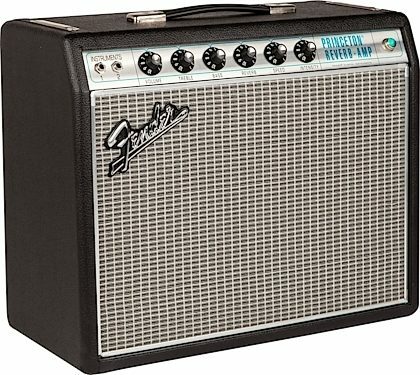 The '68 Custom Princeton Reverb Guitar Combo Amplifier is one of Fender's recently re-issued Custom Series "silverface" amplifiers. These amps celebrate the landmark year when Fender brought the electric guitar amplifier into new sonic territory with a tube-driven tone that has long since become legendary. This amp's single 10-inch Celestion speaker delivers a tightly focused and manageable tone, that makes it easy to get a great sound in the studio from the moment you mic it up. When you want a clean sound, the '68 Custom Princeton Reverb presents a shimmering tone with lots of color and overtones. And when you push the gain a little further, you'll find plenty of compelling and musical crunch sounds to play with. The '68 Custom Princeton Reverb is a single-channel amplifier with two 1/4-inch inputs that can be used individually or in tandem. The Volume, Treble, and Bass knobs allow you to shape the overall contour of your tone, while the Reverb, Speed, and Intensity knobs allow you to dial up "wet" tones that range from surf and rockabilly to flat-out psychedelic and cosmic. The The '68 Custom Princeton Reverb gets its distinctive sound from 3 x 12AX7 and 1 X 12AT7 preamp tubes. 2 x 6V6 power tubes amplify this vintage sound to move 12 watts of power. The single 10-inch Celestion TEN 30 yields a super-manageable output, allowing you to push the preamp as far as you like without becoming too loud for studio work. With so much nuance in a small amp, you can explore a whole world of tonal range just adjusting the Volume knob. 1968 was a transitional year for Fender amps, with tone that was still pure Fender but a look that was modern. 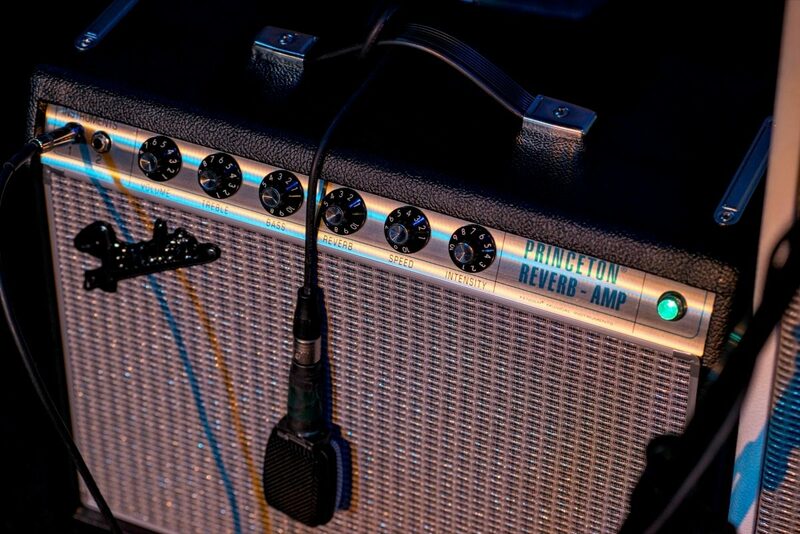 With a silver-and-turquoise front panel and classy aluminum "drip edge" grille cloth trim, the Princeton Reverb received a fresh face as it remained the perfect recording and gigging amp. Small, light and moderately powered, it produced big tube tone, with world-class Fender reverb and vibrato effects. For countless guitarists ever since, the Princeton Reverb has been the go-to amp for classic Fender sound. The Fender '68 Custom Princeton Reverb Amp pays tribute to the classic look, sound and performance of Fender's late-'60s "silverface" amps. In a special twist, a modified tone circuit gives modern players greater tonal flexibility with pedals, and the amp's reduced negative feedback gives greater touch sensitivity and quicker onset of overdrive. The '68 Custom Princeton Reverb's single 10" Celestion(R) TEN 30 speaker also delivers a more distinctively rock 'n' roll flavor. Overall: I waited six months to write about this amp as to really evaluate it fairly. First off this has helped me gig with a damaged back ,I can no longer lift the mighty twin. Funny enough my twin never went past 4, but strangely either does this Princeton, it's a mighty beast! I play in a 4 piece band , really a trio with a harp player and my fear was no way it would keep up with drummer, and AmPeg 450 watt bass player. Wrong I'm on top and never drowned out at all with head room to spare. I use it in conjunction with pedal board and we play country, blues, classic rock and some actual metal, Motörhead cover, guess which one? Man this sucker has passed my expectations totally and yes I gave it a four but the only way I give five star is if it gives o.gasms lol. It practically does.. Reverb sweet I never breach 3, tremelo sweet use it sparingly but very tasty, responsive to touch as described, I've only played my hot rod custom mim strat plus with floyd and rio grande pic ups hss. That guitar surpasses my American and has a very versatile array of tones. I can't believe I haven't tryed my lp but soon and I'm sure it will cook! This amp is easy easy just plug your stuff dial in simple easy mostly treb, less on bass as she's bassey for such a small thing. I got scared the other night with some sound cutting out but it was the stupid cable, worried a bit because just added three pedals to my board. I'm sorry to go off subject, but really if you like loud, light , fender sound, versatile with pedals this baby is great. I tryed the hot rod and supersonic first, hot rod to loud, supersonic was to laden with popping switches too bad I wanted that thing in theory, but in the end I got what I need, good tone light package, band able. I heard a sane that goes if your bands too loud for a Princeton your bands too loud, I'm a believer. I had all the Marshall stack stuff 100 watt stuff and really never got to play them to their full tonal potential because of volume issues, I mean you want to hear the vocals right? Well really want you folks to know that this amp is a worthy contender to the stage and studio and I love it! Keep it real, keep it fender! Rock on peeps. Overall: I purchased this from ZZ as a B-Stock, and it is in perfect condition. The sound is amazing, I got rid of my hand-wired boutique amp with 6V6 tubes for this one. It sounds absolutely amazing with my strat and tele. My MIA PRS gets great crunch, in the main input, but you need to use teh secondary input to get a clean tone out of it. This amp is louder than you might think, gets louder up till about 5 and then just gets crunchier, but not tweedish crunch, more like a British crunch (must be the speaker they paired with it). I had some fun this weekend and maxed out the amp with my Strat and it was tonal bliss and the amp cleaned up nice when i rolled the dial back and the strat cleaned up beautifully. The amp is very touch responsive. I highly recommend this amp, if you need something louder just mic it!